Having created a publication, the next step is to assign a theme to it, which will determine the publication's appearance and functionality for your readers. On the Configure sub-menu, click Themes. 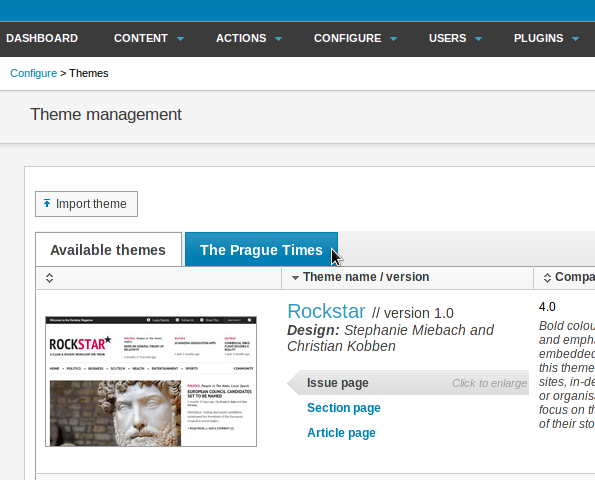 This will open the Theme Management page, displaying a table with the available themes installed by your system administrator, such as The New Custodian or Rockstar. You may also see a theme called Empty which is a skeleton for creating your own theme. See the chapter Importing and exporting themes to add new themes to your server. 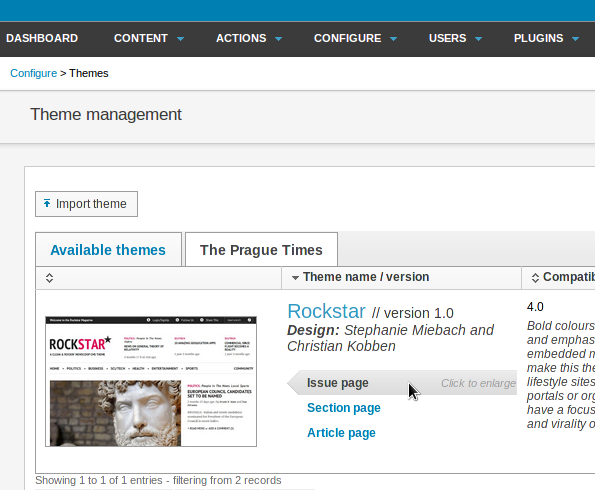 Each of the current publications has a corresponding tab at the top of the table, for example "The Prague Times". The main templates within each theme can be previewed in the window on the left side of the table, by hovering your mouse over the links for Issue page, Section page and Article page. Click any of the links to open a larger preview in a pop-up window. You can close this pop-up window by clicking the x icon in the upper right corner. To assign a theme to your new publication, click Actions on the right side of the table row for the theme of your choice. On the menu which pops up, click Add to publication, then the name of the publication that you have created. This action creates an independent copy of the theme for your publication. 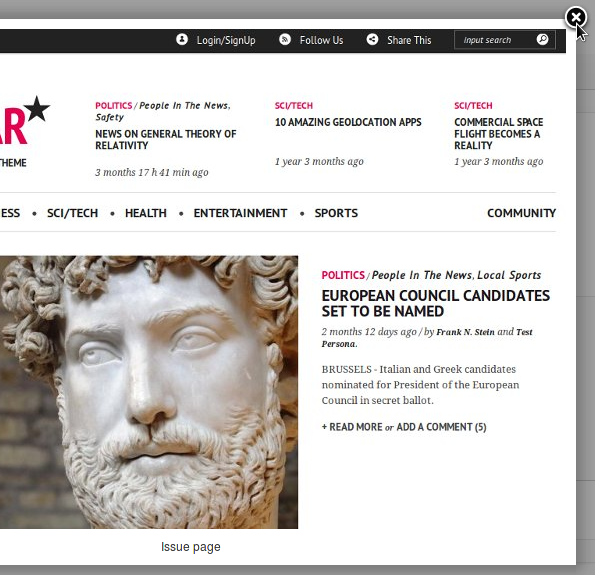 Any changes made to the theme for other publications on the same Newscoop server will not affect your publication. Newscoop should report Assigned successfully, just above the Actions menu. The tab for your publication should now display the theme that you chose. The theme can be unassigned from the publication using the Actions pop-up menu in this tab, if it is not being used by any issue in that publication. You should now reload the image renditions to suit the new theme - see the chapter Image rendering for details.